What's the BMC manhole covers? The manhole covers are made of BMC (Bulk Molding Compound), generally speaking, it's a kind of fiber glass or glass steel. It's also named by SABS as Polymer Concrete manhole cover, but the word "concrete" may mislead to think of cement, we recommend calling it Polymer manhole cover. It's not ordinary plastics or cement made. Read more Manufacturing of Primus® and Wuzland® manhole covers. How do you name your manhole covers? The product codes? Primus® and Wuzland® manhole covers, sewer or drain covers, gully gratings or grids covers and trench covers are named by their dimensions of the covers, not their clear opening (inner dimensions of frames), so do the product codes. We also name our products by the SABS codes such as Type 2A, Code 5, etc. What's the duty classification of your manhole covers? Based upon the standard of SABS (SANS1882:2003 and 558:2009), our Primus® and Wuzland® manhole covers are divided into three duty classes of light (L), medium (M) and heavy (H), however each duty class is further subdivided into some groups by the force resistance or load capacity of the manhole covers against the vehicles which are allowed to be driven over safely and the Gross Weight of such vehicles is indicated as figures in Tons, for example, M10, means medium duty and maximum 10 tons gross weight of vehicle allowed to drive over the covers. What's the Weight Tolerance or Load Capacity of the covers? Simply to say in practice, all of these concepts indicate the estimated weight of vehicles (GVM) which are allowed to be driven over the specific manhole covers safely. If specified, they are used to indicate the strength of manhole covers which are capable of taking such figures of weight. How to estimate the maximum weight of vehicle on covers? The force applied to the cover can be estimated in an average of total vehicle weight shared into each wheel. However we CAN NOT calculate the maximum weight of vehicle allowed to access the cover from the Load Capacity or Force Resistance of the manhole cover simply by the formula: maximum vehicle weight = number of wheels x Force Resistance of cover, and the conversion formula: 1 KN = 102.04 KG or 10 KN ≈ 1 TONS because there are many factors would affect the accuracy of the calculation and could actually make the big difference. We strongly recommend using the figures provided by our manufacturers for your purchase. Can I drive an overweight vehicle over the specific cover? The figures of Load Capacity of our manhole covers are usually estimated conservatively for the consideration of safety, you may try it sometimes when have to do so, but our guarantee does not cover the damage caused in this case. Anyway we do not recommend parking the vehicle with the wheel right onto the cover for a long time. Never drive a vehicle of which GVM is exceeding the maximum vehicle weight calculated by the above-mentioned formula over such a manhole cover. Which Standard do you use for your manhole covers? Certainly we use SABS (SANS1882 and 558) Standards. Many countries have their own Standards for the manhole covers. Europe Unions' Standard EN124 is quite popular and recognized by many countries including South Africa. Now EN124:1994 is verified as SABS (SANS 50124:1994) by SABS. Can your covers be cut to fit into my existing frame? Yes, our manhole covers can be cut by grinder to fit the existing frame on the manhole but this may affect its Load Capacity. The usage duration of the manhole covers will not be shortened in this case. Are your manhole covers lockable? Any key holes? Most of our Wuzland® and Primus® manhole covers can be installed with our locks as an option, but it may not be easy to drill the suitable lock holes for the locks. Now these lock holes were pre-moulded in our new designed 9B and 9D manhole covers. There are existing key holes, actually the lifting holes on the covers, in the Wuzland® covers, the holes were closed which can be easily broken through when needed to do, and now the lifting rings or handles are also available as an option. How to open Wuzland® manhole covers? There are two closed key holes or opening holes in the covers, which can be easily broken through. Should the holes be kept closed to avoid the water flowing into the manhole, a small horizon hole can be drilled in the existing key hole, and an iron hook can be used to lift the cover, such as our 9B manhole covers. We now supply the stainless lifting keys. For our new designed 9D manhole covers the lifting rings are available as an option to be fitted on the covers so that the keyholes can be kept closed. How long the validation of your quotation? Wuzland® and Primus® manhole covers are quoted usually for the validation of 3 MONTHS. Should the price validation of the quote needs to be extended especially for a tender, please let us know. The prices are subject to change without notice except the valid quotation. 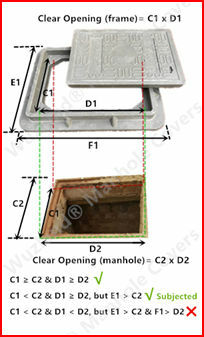 The clear opening of the manhole cover (C1 x D1) should NOT be less than the one of manhole (C2 x D2). Should there be no duty required such as in walkway or heavy duty one to be used for medium duty function, two sides of opposite may be less (C1 < C2) while the other two have to be NOT (D1 ≥ D2) if the manhole covers of correct sizes would not be found. It's not recommended to have the manhole covers with shorter clear opening of all sides installed in any situations. Our polymer concrete manhole covers, sewer and drain covers, trench covers, gully gratings and grids inlets have been classified into many duty types for different requirement. We convert this Duties Classification into the weight of vehicles (GVM) which allow to be driven over for easily understanding in practice. The clients should consider the heaviest vehicles may access unexpectedly and cause damage when they select the duty for normal situation. 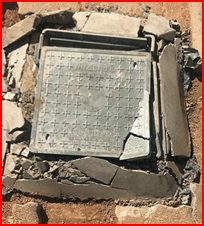 When opening, moving, carrying and shipping the polymer manhole covers, do NOT throw the polymer manhole covers to the ground, avoid striking or crashing with other hard articles, as well as other polymer manhole covers, or the collision between covers and their frames, which may cause minor edge damage especially of the frames. To open or lift the cover with the steel hooks through the keyholes, especially for heavy duty covers which are heavy while being opened regularly, we strongly recommend using two hooks to lift the cover through two keyholes at the same time, should it be done with one hook through one keyhole, lift one side of the cover just enough for the hands to hold it, then open the cover by hands, thus to avoid the hook damaging the keyhole. Doing carelessly may cause the holes worn out bigger and bigger. Most of lockholes and keyholes or lifting holes in our manhole covers are pre-closed, to open these holes, you have to break the closed holes with a screw driver from the back side (the closed side) to avoid chipping out the material surrounding the holes, driller is recommended doing so especially the pre-closed layer is thicker. Incorrect installation may cause serious damage to the polymer manhole covers, sewer and drain covers, trench covers, gully gratings or grids inlets and their frames. For heavy duty manhole covers, especially in busy driveway, the ground base should be constructed strong enough to hold the manhole covers to avoid being pressed down by the vehicles, which may cause damage. The surrounding concrete should be repaired in time before further damage to the manhole covers. Should the manhole covers be damaged, such as the above mentioned worn out key holes , lifting holes or the chipped out edges, cool tar or "bakkie back" is recommended to apply for the repairment.